Nathan Flomm (Larry David) is a marketing executive who sells his shares in an electric car company that is on the verge of going public, then becomes a laughing stock when the company enjoys huge success. To hide from the hordes of people who mock him for losing out on billions of dollars, he moves from California to Martha's Vineyard and changes his name to Rolly DaVore. He manages to build a quiet life over the next decade, working as a caterer for an elderly woman and generally being a pillar of the community, but his tranquillity is shattered when his former business partner Will Haney (Jon Hamm) arrives on the island with his new wife Rhonda (Kate Hudson). Rolly very quickly decides that this is the perfect opportunity to wreak vengeance on the man who cost him a fortune. For most of the first act, Larry David appears with shoulder-length scraggly hair and a shamanic beard. 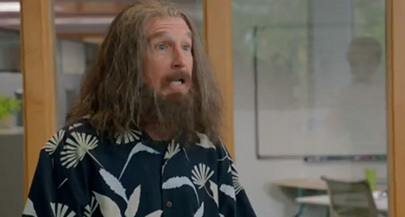 The main purpose of this, other than to make him look eerily similar to prolific Seinfeld writer and Borat director Larry Charles, is to set up the conceit of Clear History's revenge plot: even though they worked together fairly closely, Will fails to recognize Rolly because without the hair and the beard he looks completely different. This allows Rolly to get a job helping to construct Will's new McMansion with the hopes of then blowing it up - a plan he decides upon after watching the film version of The Fountainhead, making it arguably one of the least destructive acts ever inspired by Ayn Rand - with the help of a cadre of friends played by Danny McBride, Bill Hader and an almost unrecognizable Michael Keaton. An inadvertent side effect of David's Rick Rubin look is that it acts as a metaphor for the film itself. Even underneath all the makeup, Norman's mannerisms and standoffish approach to social situations can't hide the fact that he is played by Larry David; and even though Clear History disguises itself with the trappings of a new location and new character names, it can't hide that it is basically a feature-length episode of Curb Your Enthusiasm. Everything from the biting tone to the loose, handheld visual style (director Greg Mottola does add some more cinematic style to the non-dialogue scenes, at least), right down to its improvised conversations about minutiae mark it as, if not a spin-off of Curb Your Enthusiasm, then certainly an offshoot from the same gnarled tree that is Larry David's worldview. Larry David might not play the character of Larry David, but he still plays a Larry David type, which is splitting the very finest of hairs. As someone who loves Curb Your Enthusiasm, watching David and his frequent collaborators Alec Berg, David Mandel and Jeff Schaffer take their show on the road is something I have no problem with, especially since Clear History might be the closest thing we get to new Curb for a while, depending on when and if David wants to make more episodes. However, that doesn't stop the film from often feeling like several episodes of the show crammed into an hour and a half. The central revenge plot, which is to an extent a rehash of David's 1998 debut feature Sour Grapes (which was already semi-remade in 2003 as Envy, making Clear History the third time that some variation on this story has been told), is pretty slender, often serving only as a skeleton on which to hang scenes between Rolly and his collaborators. Most of the scenes relate to Rolly's plan in some way or another, but generally speaking the story is treated as a jumping off point for the cast rather than an end in and off itself.